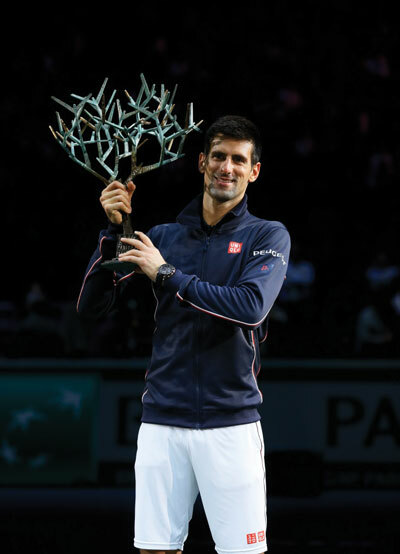 Paris/France — HEAD Racquet Rebel Novak Djokovic has won the BNP Paribas Masters for the third time in six years, becoming the first man to ever back up the title at the Bercy Arena with his 6-2, 6-3 defeat over Milos Raonic. With his triumph, he is the fifth active player to record 600 tour-level match wins. The new father - his son Stefan was born ten days ago - is the 23rd player in the Open Era to achieve the feat. World No. 1 Djokovic claimed the 47th trophy of his career and his sixth of the season to lead the ATP World Tour in that category. Djokovic now owns 20 ATP World Tour Master titles, winning four in 2014 including Indian Wells, Miami and Rome, with a 57-8 record this season. His previous Paris titles came in 2009 and a year ago. Djokovic, who endorses the HEAD Graphene Speed, now travels to the ATP World Tour Finals in London as a clear title contender, with fellow HEAD players Andy Murray, who endorses the HEAD Graphene Radical, Tomas Berdych (endorsing the HEAD Graphene Instinct) and Marin Cilic (endorsing the HEAD Graphene Prestige) also playing in the elite eight-man season wrap-up.